Introduced in 1994, the 7.3-liter Power Stroke engine uses an injector drive module. Unlike gasoline engines, diesel engines rely on heat from compression to ignite the air fuel mixture. This high compression requires equally high injection pressures. 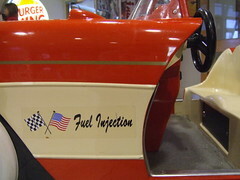 Older Ford diesels used a hydraulic injection system. Through that system, fuel pressurized, causing the injection pump to trigger the injector. The problem with the hydraulic injection system was that air entering the fuel lines would often disable the injectors, or hamper their operation significantly. The 7.3-liter Power Stroke operates with fuel being supplied to the injectors through fuel rails inside the cylinder heads, as well as high pressure engine oil. A computer determines when a cylinder should fire, and then signals the Injector Driver Module, which sends a pulse-width modulated signal to the injector solenoid. The solenoid then opens a poppet valve, thereby allowing high pressure oil to flow into the intensifier piston. The piston is forced down, which pressurizes fuel inside the injector. When fuel pressure in the injector reaches roughly 2,700 psi, the injector pintle rises and fuel is injected into the cylinder. To replace the driver, access it through the driver side fender by removing the inner fender lining. Take care to ensure connections are free of corrosion before installation.